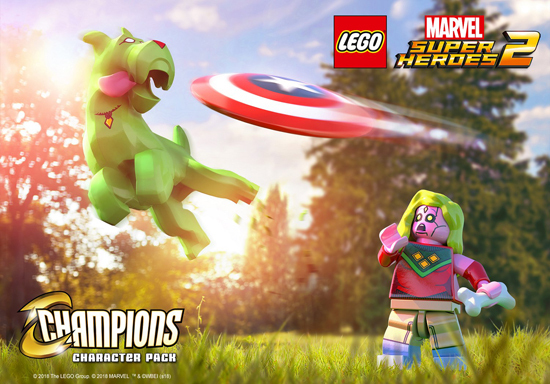 The next downloadable Character Pack for LEGO Marvel Super Heroes 2. The upcoming pack, priced at £1.69 on PlayStation 4 and £1.59 on Xbox One, will add characters from Marvel Comics’ popular Champions comic book series, offering players the chance to unleash the limitless strength of Amadeus Cho and supersonic flight of Nova. The pack also includes Ironheart, Devil Dinosaur, Moon Girl, Viv, Wasp (Nadia Pym), and Hawkeye (Kate Bishop), expanding the main game’s roster of over 200 Superheroes and Supervillains. The Champions are a group of teenage Superheroes started by three Avengers disillusioned by the behaviour of their elders and the general state of distrust by the people towards super-powered beings. Eager to show the world what it truly means to be a Superhero, they formed their own team and soon recruited other teenagers with similar ideals to their cause. Together they are determined to change the world their own way! LEGO Marvel Super Heroes 2 is an all-new, epic adventure and sequel to the smash hit, LEGO , Marvel Super Heroes. This original branching storyline, co-written by award-winning comic book writer Kurt Busiek, transports players into a cosmic battle across a myriad of Marvel locations ripped from time and space and combined to form the incredible Open Hub World of Chronopolis. Packed with signature LEGO humour for fans of all ages, gamers will go head-to-head with the time-travelling Kang the Conqueror in this fun-filled journey spanning the Marvel Universe. The Champions character pack can be purchased separately or as part of the Season Pass, which provides access to six Level Packs and four Character Packs, including the previously released Guardians of the Galaxy Vol. 2 , and the Out of Time and Agents of Atlas Character Packs. The Season Pass is available for £11.99 or as part of the LEGO Marvel Super Heroes 2 Deluxe Edition, which features the main game, access to the Classic Guardians of the Galaxy Character Pack, and an exclusive Giant-Man LEGO Minifigure (Minifigure only available in the physical version of the Deluxe Edition). LEGO Marvel Super Heroes 2 is available on PlayStation 4, Xbox One, Nintendo Switch and Windows PC.